Tropical Storm Isaac put Shell Point in the “cone of uncertainty” for days before landfall. It's threat activated a small band (not to be confused with the very large Festoons band) of SPSC members who helped to prepare the training trailer for its move to a safer place. We now know that our somewhat sketchy evacuation plan works and the details will be fine tuned for storms of the future. 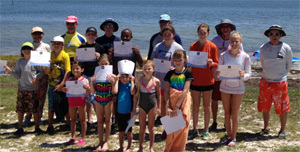 The final lessons of the summer with a troop of scouts was a success on many fronts withstanding the 15-30 knot breeze and a few squalls that challenged the patience and determination of trainers and trainees alike. I doff my cap to all the scouts who enjoyed their experience thoroughly despite being ejected from the board into the water countless times by the sail, wind and waves. Their glass was full all day. 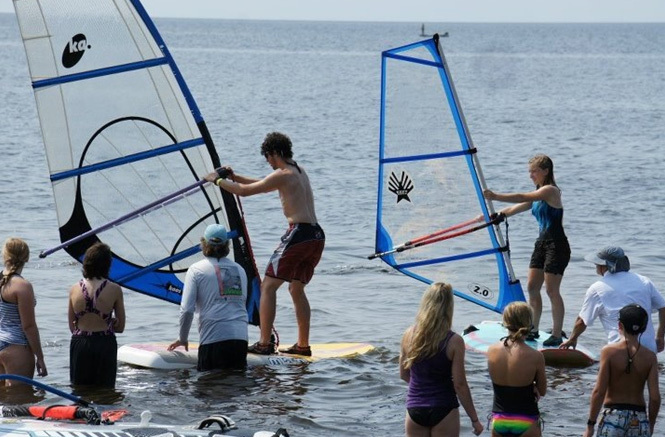 The Endless Summer Sailboard Classic is here, September 28th through 30th. Early registration ends this Friday, so get online and use Paypal to register or print the form and mail it to us. Early registration gets you a shirt(s) in the size you specify and $5.00 off the cost. All the details are on our website (hint you are already on our website if you are reading this article.). Many thanks to Deb for getting all the event information posted and all the interactive stuff working so smoothly. Notice that she has also added the feature of paying your annual SPSC membership dues via Paypal. Dues are due! ELECTIONS! ELECTIONS! ELECTIONS! Don't miss the monthly SPSC general meeting at Beef O'Brady's this Tuesday, September 11th. We will elect a new Board for 2013. Last Lesson, an Adventure for Scouting!!!! What a great last lesson we had on September 8th. This day was taken wholly by a couple boy scout troops, troop 5 and 8, and those kids had tenacity. This past Saturday saw various rain showers blow through, winds at one time at a sustained 25knots and averaging 20 for the four hour lesson period. The wind mostly came from the southwest, but switched to due west, then due south during some periods. With the wind like it was, the water was a bit rough. Yet, time after time, for four hours, these kids would get on the board, up haul the sail, and try and hang on, and many of them did. Fearless. I was very glad to see Perry, Alex, Bill, and Bob Andrews take off every now and again so the kids could see what the sport is about, and I really think it encouraged them to keep getting up and trying. If anyone thinks kids these days don’t get out enough and are not active enough, these kids put that mindset to rest quickly. I was getting worn our just watching them. The scouts actually have a boardsailing patch that their scouts can earn. I have the requirements, which are pretty tough, for them to earn it. We may not be able to do it because we would need a certified instructor, no, not certifiable, but certified. I think our instructors are as good as any that are certified, but I understand the Boy Scouts need for quality control. Last, but certainly not least, thanks to all the folks that made training possible. This last lesson required us to haul equipment from the trailer to the shore. For those completely out of the loop, the training trailer was moved further from the beach due to the threat of storms. Using a trailer that Perry brought down and another that Bob Andrews brought, we got everything moved in one trip. Training this year has been a lot of fun. From days where there was no wind to ones that had steady wind at 20 knots and gusts higher, the students were fun to be around. 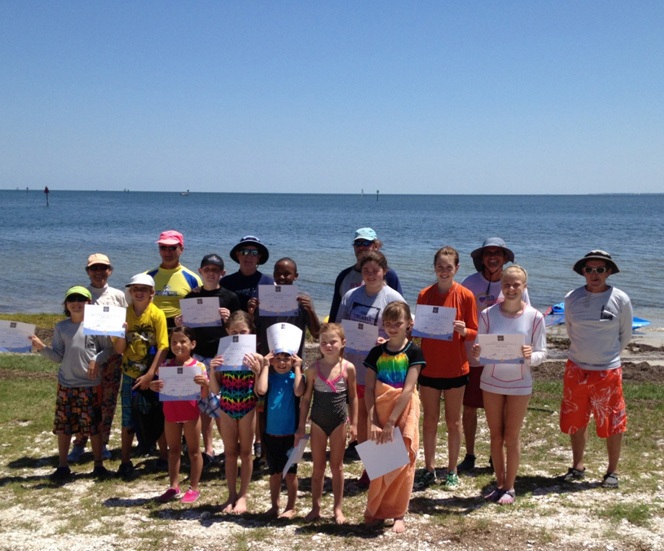 This year we taught two different groups of scouts, Venture scouts and Boy scouts, and we gave lessons over in Panama City during our NIMBY regatta. We also had our first family day, a day when members kids came out to sail, a very successful event. There are so many people to thank. First, I would like to thank the SPSC and its dedication to lessons. The trailer that many people have sweat equity in has been a boon to training, allowing the instructors to be setup quickly and to break down quickly. The instructors have been incredible. 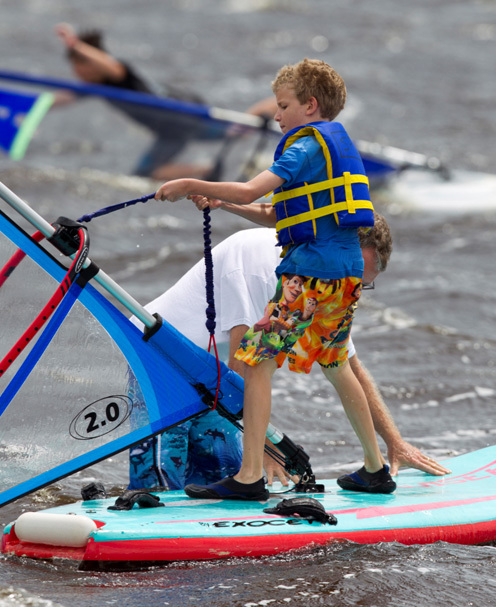 Charlie Yontz, who took lessons last year wanted to give back and has done so with interest. Charlie hasn’t missed a lesson. Same goes for Tina who hasn’t missed any. You may not be able to get in touch with her through e-mail, but she is there every Saturday lessons are being taught. Bill Olson has helped with almost all the lessons as has Linda Downey, Nora Lloyd and Bob Andrews. Heck Bob A. had to lead the first one because your truly, a retiree, felt the need to vacation for a week in Corpus Christi. Nora has been kind enough to also let us use her board and smaller sail and has taken pictures at most of the lessons. Mark Powell has helped out on occasion and contributed a small sail to our arsenal for when we taught the young-uns. Our accomplishments are due to the hard work of all the trainers and all those people whose idea it was to get the scouts involved and to have a kid’s day. Fortunately, all I had to do was coordinate the efforts of all the creative and hardworking people that make this happen. Thank you. The summer race series is over, ending on September 8th with winds ranging between 15 and 25 knots. The last race, as you can see from the picture taken from the beach, was very well attended (I’m way up front, so you can’t see me). Team SPSC, who are all in the picture as well, consisted of Perry, Bob Andrews, Alex, Bill, Bob G. and Danielle. Everyone did pretty well, but our team was beaten by the teams from Two Egg and Monticello. We did beat the teams from Savannah State, Kazakhstan, and Alaska, just to name a few. Wish you could have participated because the grand prize was free entrance into next year’s summer series. $6,500 requested for the Endless Summer budget. Since Mark V. had not yet made his way to the meeting, it was unanimously approved. Bob mentioned that the Rum ‘n’ Root Beer was pretty darn good. Purser reported money in checking with $154 expenses for training outstanding. There are currently 66 memberships, which, since that number includes family memberships, and family memberships number at least two adults and sometime a few young-uns, would mean we have more than 66 members. Notice the difference here between members and membership. Members aren’t hip unless they have a membership, so JOIN today, Uncle Swami wants you! Mark V. suggested that the past commodore should take responsibility for ensuring the door to our meeting room stay closed. After a vote, it was determined that was way too much responsibility for a past commodore. After much discussion it was determined that we were to vote for at large members, not large members and that the Past Commodore is not an elected position because it is a position of divine providence from which wisdom is sought and enlightenment entertaining. DUES ARE DUE AT THE SEPTEMBER MEETING!!!!!! 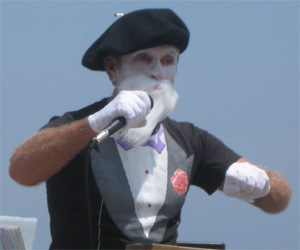 Of course, you probably didn’t read the newsletter until after that meeting, so you can get on-line NOW to 20knotsnob.com/membership OR fill out your registration form for the 25th annual Endless Summer Sailboard Classic, and pay your dues on that form. Robert Faircloth brought a Mayan calendar to the R&R so that Bob A. can complete his work for the Last Mayan Endless Summer Sailboard Classic and to make sure the regatta takes place before the end of the world. Mike Levine wanted to know if sponsorship levels can be put on-line. Since sponsorship levels may vary, the answer was “no need to”. Bob G mentioned an event that will be taking place in Jacksonville on October 6. Check our website to see what it is. Don mentioned that Donaldo’s of Paris, New York, and Shell Point will be on the beach for the Gumbo contest and that Scotty’s dogs of Crawfordville, Woodville, and Greenville will once again be the place to go for lunch. Don mentioned the Atlanta Fall Classic and gave it great reviews, encouraging many to attend. For those that are really out of it, the Atlanta Fall Classic is not really in Atlanta, but on Lake Lanier, in a quaint little town called Flowery Branch. But the Flowery Branch Fall Classic doesn’t have the same big time ring as Atlanta. Bill motioned to adjourn at 8:27, Perry seconded, and all were in favor. Since the meeting was adjourned, I cannot write about the incredible things that happened afterwards. Oh my gosh, I couldn’t believe it. You could read it on my blog, but I don’t have one. Should have been there.